My MIL had told me to include pulses in our regular diet at least once in a week as they are a good source of protein for vegetarians with lots of health benefits. Usually I make sundal with green gram, chana, black urad dal. In my family, we love to eat sundal recipes but not often. 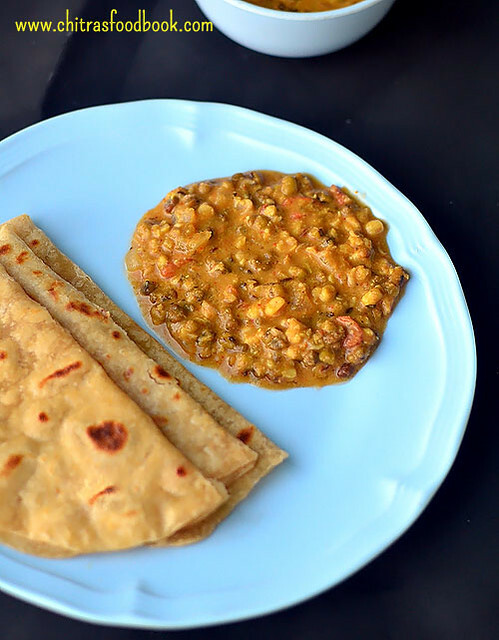 So when my MIL told me to include legumes, I found making some curry, gravy for roti or kuzhambu recipes for rice by adding pulses is the best way to make my family eat it. So I started preparing varieties of curries and gravies for rice, roti and even for idli, dosa. This South Indian style green gram curry is our recent favorite. Green gram also known as Mung bean in English, Pachai payaru in Tamil, moong sabut/mung sabut in Hindi, Cheru Payru in Malayalam, Hesaru kaalu in Kannada, Pacha Pesalu pappu in Telugu is a very healthy pulse with high fiber and nutrient values. Recent days I have been eating mung sprouts salad for weight loss.So I tried this pacha payaru curry recipe from a Kerala YouTube channel “Garam masala” with the leftover sprouts mainly for Sendhil and Raksha. I made it with slight modifications to suit our taste buds. It came out really well with a mild sweet taste of sprouted green gram. We all loved it very much. It was a good side dish for roti/ chapathi , idli, dosa and rice. As the yield of this gravy is more, we had this gravy for dinner and the next day’s breakfast & lunch as well. 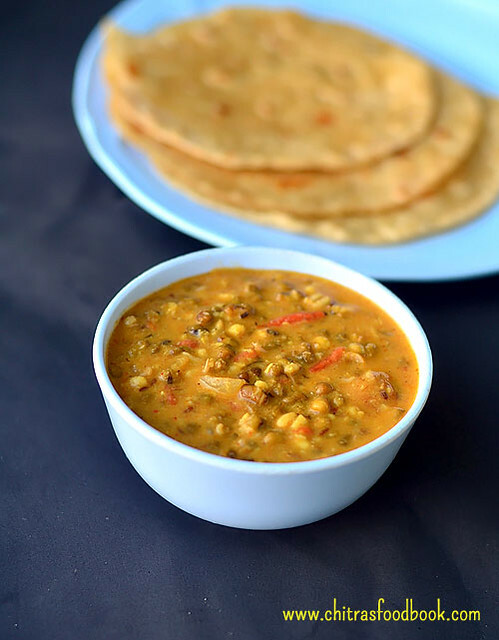 For variations, this curry can be made with mixed sprouts or with soaked green gram dal, chana or cowpeas. I am happy that I have got a healthy, yummy green gram dal curry recipe to include in our regular diet. 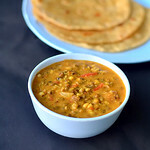 Ok Friends, lets see how to make this healthy mulai kattiya pachai payaru curry/ sprouted green gram dal gravy with step by step photos and a video ! Check out my Green gram dosa, green gram rice upma and green gram sundal recipes ! For making sprouts : Take green gram in a bowl and wash it. Add enough water to immerse it well. Let it soak for 12 hours or overnight.The next day morning, drain the excess water and wrap the soaked green gram in a cloth or keep it in a closed bowl. Leave it for a day. The next day, you can see small sprouts. If you leave it for more than a day, the size of sprouts will become bigger. For this gravy, you can use just soaked green gram instead of sprouted ones. Grind grated coconut, cashews, garlic cloves, fennel seeds and chopped big onion to a smooth paste adding enough water. Set aside. In a cooker base, take 1 cup of sprouted green gram and add 2 cups of water. Pressure cook in very low flame for 2 whistles. Remove the lid after steam is released and mix well. Set aside. Heat oil in kadai and splutter cumin seeds. Add onion and saute till transparent. Add chopped tomato and saute till mushy. Add the required salt, turmeric powder, red chilli powder and garam masala powder. Saute quickly for a minute without burning. Now add the ground coconut paste, saute for a minute and add 1/2 cup of water.Let it boil for few minutes till raw smell goes off. Now add the cooked green gram dal and mix well.Check for taste and add more salt, chilli powder or garam masala powder if needed. Let the gravy boil for 5 minutes. Lastly add the crushed kasoori methi and mix well. Switch off the flame and serve hot with roti or rice !Enjoy ! For variations, you can replace green gram with cooked chana/chickpeas. If you want to omit coconut, just skip it and grind the remaining ingredients alone. In that case, add less water while boiling to get thick gravy. 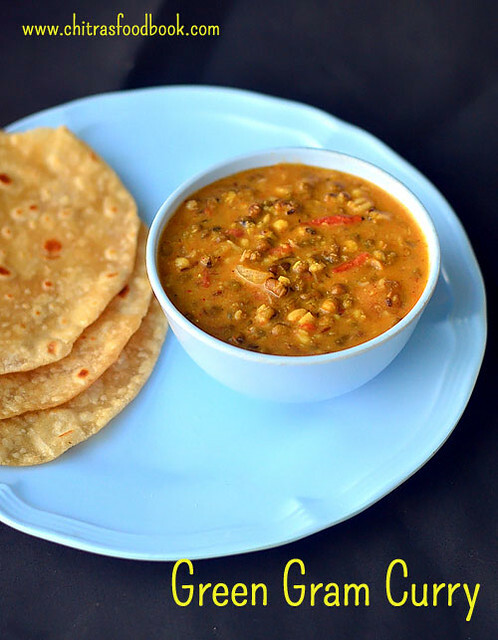 Do try this healthy, flavorful green gram curry for roti and rice. Enjoy !